Advent is a time of waiting, hoping and expecting. As Mary's pregnancy entered its final trimester she waited in nervous anticipation for the God-child promised by the Spirit. As the elbows of the Son of God pushed at her ribs, as his head pushed down into her pelvis and as she could trace his spine along her swollen belly, she longed to see his face, count his fingers and see if her first child resembled her in any way - to see if this God-child would look 'normal' or strangely holy. There was no denying that a promise was about to be fulfilled, but what exactly this would look like she could only guess. As Mary's pregnancy entered its final trimester the people of Israel waited in nervous anticipation for their promised redeemer, a ruler expected to fulfil prophecies of liberation, deliverance and freedom and initiate a shift in power and control in their favour. They longed to see their values honoured and respected once again, their way of life understood and they longed to end their time of living as exiles in their own land. There was no denying that a promise was soon to be fulfilled, but what exactly this would look like they could only guess. Only a few anticipated the surprises that would be in store. As Mary's pregnancy is once again remembered and honoured the followers of Jesus in Britain and much of Western Europe wait in nervous anticipation of what the place of Christianity will be in an increasingly post-Christendom society. Some long for their values and beliefs to be respected and honoured as in days gone by and in fear of alternative ideals pray for a shift in power in their favour. Others embrace the invitation to live on the margins as exiles, choosing to live in hopeful anticipation of God's ability to move even in the midst of perceived weakness, vulnerability, powerlessness and uncertainty. Some dream of an impossible return to the past. Some motivate us to hope for a confident, powerful future. Some urge us to hold onto the light in the coming darkness and anticipate surprises. For Mary there was no turning back the clock. There was a privileged and optimistic journey ushering ultimate hope and opportunity, but there was also danger, darkness, pain and cost as she carried the Light into a World which didn't always understand and recognise it. 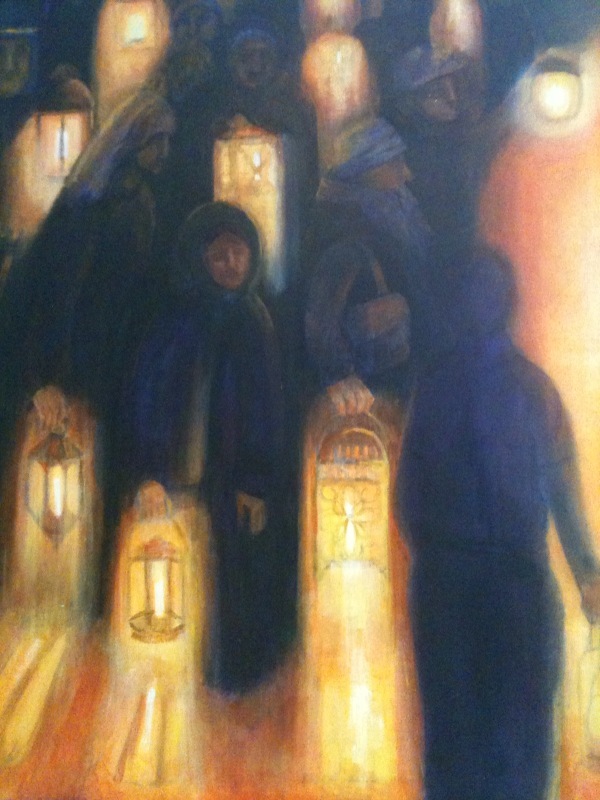 As we continue to follow Jesus in uncertain times may we faithfully reflect the radiance of the Light of the World as he shines eternally in the darkness and keep our eyes open for other Lantern Bearers and signs of Light evidenced in creative ways of following Jesus on the margins. Thank you Juliet, a very thoughtful post. Good to hear from you on here. Thank you.